This Sunday begins the climax of our liturgical year as we walk with Jesus on his triumphant entry into Jerusalem, then to his last supper with his friends, his arrest and crucifixion and his glorious resurrection on Easter Sunday. When Jesus and his disciples drew near to Jerusalem, to Bethphage and Bethany at the Mount of Olives, he sent two of his disciples and said to them, "Go into the village opposite you, and immediately on entering it, you will find a colt tethered on which no one has ever sat. Untie it and bring it here. If anyone should say to you, 'Why are you doing this?' reply, 'The Master has need of it and will send it back here at once.'" So they went off and found a colt tethered at a gate outside on the street, and they untied it. Some of the bystanders said to them, "What are you doing, untying the colt?" They answered them just as Jesus had told them to, and they permitted them to do it. So they brought the colt to Jesus and put their cloaks over it. And he sat on it. Many people spread their cloaks on the road, and others spread leafy branches that they had cut from the fields. 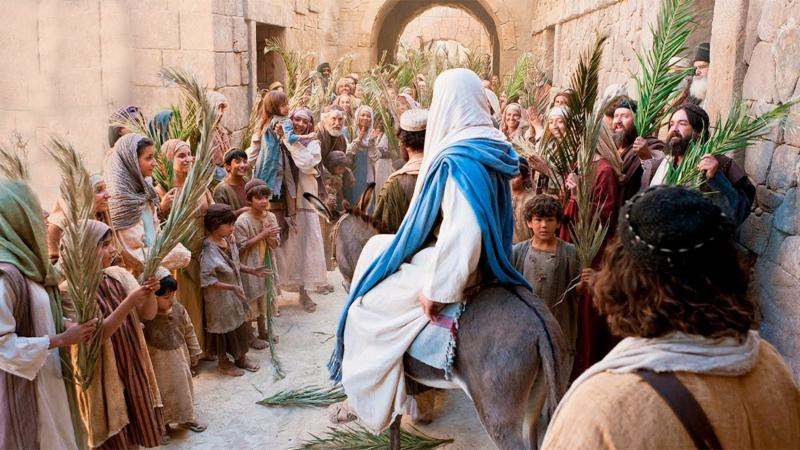 Those preceding him as well as those following kept crying out: "Hosanna! Blessed is he who comes in the name of the Lord! Blessed is the kingdom of our father David that is to come! Hosanna in the highest!" As we continue the Mass with our first reading (Isaiah 50:4-7), we recall Isaiah's prophesy of the suffering servant, persecuted for his righteousness and yet he does not flinch. This prophesy, written around the late 6th century B.C., is said to clearly prefigure Christ. Our Epistle reading (Philippians 2:6-11) continues to emphasize the humility of Jesus, taking on the human form to unite with us, bear our suffering and atone for our sins, once, for all. Our Gospel reading is the Passion of Our Lord according to Mark (14:1 - 15:47). In Mark's account, the cross is depicted as Jesus' way to glory in accordance with the divine will. Thus the passion narrative is seen as the climax of Jesus' ministry. The Gospel reading is too lengthily to present here, but please, click HERE to read and reflect on the Gospel account of the Passion of Our Lord. May we not pass by this opportunity to reflect deeply on this mystery of God's salvation gift to us, his beloved children. Also, it would be good to reflect on Jesus' intense suffering so that we may be united with the Father as he is united with the Father.. May we emulate the humility, the obedience and the love of Jesus.